The Lockheed Martin RQ-170 Sentinel is an unmanned aerial vehicle (UAV) developed by Lockheed Martin and operated by the United States Air Force (USAF) for the Central Intelligence Agency. While the USAF has released few details on the UAV's design or capabilities, defense analysts believe that it is a stealth aircraft fitted with reconnaissance equipment. In December 2011, the Iranian armed forces claimed to have captured an RQ-170 flying over Iran. The U.S. military has acknowledged losing an RQ-170 in the region. On 13 December 2011, United States news outlets reported that a formal request for Iran to return the UAV had been issued. Iran denied the request and demanded an apology. The RQ-170 Sentinel was developed by Lockheed Martin's Skunk Works as a stealth Unmanned Aerial Vehicle (UAV). Journalists have noted design similarities between the RQ-170 and previous stealth and UAV programs such as the RQ-3 DarkStar and Polecat. It is a tailless flying wing aircraft with pods, presumably for sensors or SATCOMs, built into the upper surface of each wing. Few details of the UAV's characteristics have been released, but estimates of its wingspan range from approximately 65 feet (20 m) to 90 feet (27 m). In a December 2012 report, journalist David Axe stated that "20 or so" RQ-170s had been built. The USAF confirmed the "grainy photos of a gray, flying-wing-typed unmanned airplane near Kandahar Airfield." Since then, this aircraft has been known as "The Beast of Kandahar" in relation to the discussion of the RQ-170 Sentinel on 4 December 2009. A USAF colonel subsequently commented that RQ-170 is separate from the MQ-X program, which has yet to determine stealth or powerplant requirements, and thus the Sentinel will not replace the MQ-1 Predator and MQ-9 Reaper drones. As of May 2014[update], the U.S. military had not released any statements concerning the Sentinel since December 2009. The 30th Reconnaissance Squadron operates RQ-170 Sentinels. This squadron, which is based at Tonopah Test Range Airport in Nevada, was activated on 1 September 2005. RQ-170 Sentinels have been deployed to Afghanistan, where one was sighted at Kandahar International Airport in late 2007. This sighting, and the Sentinel's secret status at the time, led Bill Sweetman to dub it the "Beast of Kandahar". The UAV being deployed to Afghanistan, despite the Taliban having no radar, led to speculation that the aircraft was used to spy on Pakistan or Iran: "Phil Finnegan, a UAV analyst at the Teal Group, an aerospace consulting firm, suggests the stealth capabilities are being used to fly in nearby countries. Neighboring Iran has an air force and air defense system that would require stealth technology to penetrate." In August 2010, Aviation Week reported that RQ-170s either had been or were about to be redeployed to Afghanistan and that the UAVs had been fitted with a full motion video capability. The missions performed by these aircraft included flying dozens of high-altitude sorties over Pakistan to monitor a compound in the town of Abbottabad where Osama bin Laden was believed to be living. On the night of 1/2 May 2011, at least one RQ-170 monitored the area while elements of the United States Naval Special Warfare Development Group launched an assault on the compound which resulted in bin Laden's death. The aircraft provided footage of the attack which was watched live by President Barack Obama and his senior national security advisors. The RQ-170 also monitored Pakistani military radio transmissions in the area to provide warning of the response to the attack. On 27 May the Los Angeles Times reported that Pakistani officials were "alarmed" by the use of the RQ-170 over their country as the drones are "designed to evade radar and other surveillance systems, and can be used as a spy plane". Four months prior to December 2011, there were reports that RQ-170s had been flying missions over Iran during 2011. On 4 December, media reports stated that the Iranian Army's electronic warfare unit had downed an RQ-170 that violated Iranian airspace along its eastern border through overriding its controls, and had captured the lightly damaged UAV. The United States Department of Defense released a statement acknowledging that it had lost control of a UAV during the previous week, claiming that it was "flying a mission over western Afghanistan" when control was lost. The statement did not specify the model of the aircraft. The U.S. government also stated that it was still investigating the cause of the loss. On 6 December, U.S. officials acknowledged that a drone crashed in or near Iranian airspace and that it belonged to the CIA and not to ISAF as was earlier stated. The Iranian government released footage of a captured RQ-170 on 8 December. The captured drone appeared to be largely intact, except for minor damage on its left wing. Dan Goure, an analyst at the Lexington Institute, stated the largely intact airframe ruled out the possibility of an engine or navigational malfunction: "Either this was a cyber/electronic warfare attack system that brought the system down or it was a glitch in the command-and-control system". On 8 December, a senior U.S. official, speaking on condition of anonymity, told the Washington Post that the U.S. cannot be certain the drone shown was real because the U.S. does not have access to it, but also stated that "We have no indication that it was brought down by hostile fire." A second senior U.S. military official said that a major question is how the drone could have remained "virtually intact," given the high altitude from which it is thought to have crashed. After examining the video on 8 Dec, US officials confirmed that the drone was genuine, even though some civilians had initially expressed doubt. Bill Sweetman, an author with an interest in military planes, speculated that the Iranians did not shoot down the plane (citing the lack of burn marks, holes, or outward damage) or hack into the system, postulating that a system failure downed the plane, and that the plane could be intact from what is known as a "flat spin" or "falling leaf departure". 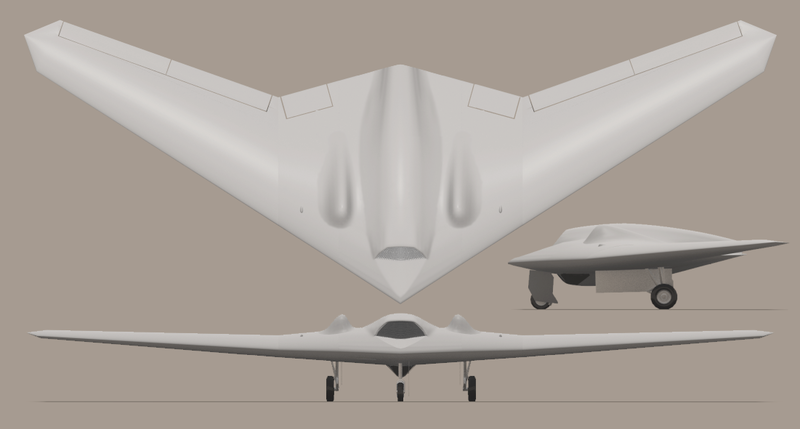 In April 2012, General Amir Ali Hajizadeh, the commander of the Iranian Revolutionary Guards aerospace division, claimed that Iran had reversed-engineered the RQ-170, and was building a copy of the UAV. He also stated that data was being recovered from the captured RQ-170. On 6 February 2013, Iranian State Television released footage purported to have been downloaded from the RQ-170. U.S. Officials say that there is no evidence that these claims are true. In September 2013, Iran claimed that it had completed a copy of the drone and that all of its surveillance data and software had been decoded. ↑ 1.0 1.1 Axe, David (13 December 2012). "7 Secret Ways America’s Stealth Armada Stays Off the Radar". http://www.wired.com/dangerroom/2012/12/steath-secrets/?pid=1688. Retrieved 14 December 2012. ↑ "The Little-Known Agency That Helped Kill Bin Laden". The Atlantic. 8 May 2011. http://www.theatlantic.com/politics/archive/2011/05/the-little-known-agency-that-helped-kill-bin-laden/238454/. Retrieved 8 May 2011. ↑ Fulghum, David A. (8 December 2009). "RQ-170 Has Links to Intelligence Loss to China". Ares. Aviation Week & Space Technology. http://www.aviationweek.com/aw/blogs/defense/index.jsp?plckController=Blog&plckBlogPage=BlogViewPost&newspaperUserId=27ec4a53-dcc8-42d0-bd3a-01329aef79a7&plckPostId=Blog%3a27ec4a53-dcc8-42d0-bd3a-01329aef79a7Post%3a7544751e-3bdc-4e52-9be7-07000988da92&plckScript=blogScript&plckElementId=blogDest. Retrieved 9 December 2009. ↑ "Mystery UAV operation in Afghanistan". UV Online. 10 April 2009. http://www.shephard.co.uk/news/2393/mystery-uav-operating-in-afghanistan/. Retrieved 9 December 2009. ↑ 7.0 7.1 7.2 7.3 7.4 Fulghum, David A. (4 December 2009). "U.S. Air Force Reveals Operational Stealth UAV". Ares. Aviation Week. http://www.aviationweek.com/aw/blogs/defense/index.jsp?plckController=Blog&plckBlogPage=BlogViewPost&newspaperUserId=27ec4a53-dcc8-42d0-bd3a-01329aef79a7&plckPostId=Blog:27ec4a53-dcc8-42d0-bd3a-01329aef79a7Post:649e3cf4-8c07-4739-82cf-322c6c56ccd5&plckScript=blogScript&plckElementId=blogDest. Retrieved 4 December 2009. ↑ 8.0 8.1 Sweetman, Bill (11 November 2009). "Another Beast Picture". Ares. Aviation Week. http://www.aviationweek.com/aw/blogs/defense/index.jsp?plckController=Blog&plckBlogPage=BlogViewPost&newspaperUserId=27ec4a53-dcc8-42d0-bd3a-01329aef79a7&plckPostId=Blog:27ec4a53-dcc8-42d0-bd3a-01329aef79a7Post:e87edbbf-7a62-44e6-94d4-e067d137ec2b&plckScript=blogScript&plckElementId=blogDest. Retrieved 13 December 2009. ↑ "RQ-170 Sentinel "Beast of Kandahar"". Defence Aviation. 26 December 2009. http://www.defenceaviation.com/2009/12/rq-170-sentinel-beast-of-kandahar-confirmed-by-us-airforce.html. Retrieved 2 December 2010. ↑ Tirpak, John A. (February 2010). "Washington Watch: Stealth skywriting; Watched by Gorgons; Stopping START? ....". Air Force Association. p. 6. ISSN 0730-6784. http://www.airforce-magazine.com/MagazineArchive/Pages/2010/February%202010/0210watch.aspx. Retrieved 12 December 2011. ↑ Fulghum, David A. (4 December 2009). "USAF Confirms Stealthy UAV Operations". Aviationweek.com. Aviation Week. http://www.aviationweek.com/aw/generic/story.jsp?id=news/BEAST120409.xml&headline=USAF%20Confirms%20Stealthy%20UAV%20Operations&channel=defense. Retrieved 8 December 2009. ↑ Trimble, Stephen (10 December 2009). "RQ-170 not intended to replace Predators and Reapers". International. http://www.flightglobal.com/blogs/the-dewline/2009/12/rq-170-not-intended-to-replace.html. Retrieved 11 December 2009. ↑ Drew, Christopher (5 May). "Attack on Bin Laden Used Stealthy Helicopter That Had Been a Secret". http://www.nytimes.com/2011/05/06/world/asia/06helicopter.html?_r=1&hp. Retrieved 6 May 2011. ↑ 14.0 14.1 14.2 14.3 14.4 14.5 Fulghum, David A.; Bill Sweetman (14 December 2009). "Stealth over Afghanistan". McGraw-Hill. pp. 26–27. ↑ Sweetman, Bill (25 January 2011). "The Beast is Back". Ares. Aviation Week. http://www.aviationweek.com/aw/blogs/defense/index.jsp?plckController=Blog&plckBlogPage=BlogViewPost&newspaperUserId=27ec4a53-dcc8-42d0-bd3a-01329aef79a7&plckPostId=Blog:27ec4a53-dcc8-42d0-bd3a-01329aef79a7Post:5b32f70f-3054-4261-947e-dc8fe095d08b&plckScript=blogScript&plckElementId=blogDest. Retrieved 26 January 2011. ↑ 16.0 16.1 Shane, Scott; Sanger, David E. (7 December 2011). "Drone Crash in Iran Reveals Secret U.S. Surveillance Effort". http://www.nytimes.com/2011/12/08/world/middleeast/drone-crash-in-iran-reveals-secret-us-surveillance-bid.html. Retrieved 9 December 2011. ↑ "Iran shows film of captured US drone". BBC News. 8 December 2011. http://www.bbc.co.uk/news/world-middle-east-16098562. ↑ Merchet, Jean-Dominique. "L'US Air Force dévoile son drone secret : c'est un RQ-170 Sentinel !". Libération. http://secretdefense.blogs.liberation.fr/defense/2009/12/lus-air-force-d%C3%A9voile-son-drone-secret-cest-un-rq-170-sentinel-.html. Retrieved 9 December 2009. ↑ Hambling, David (8 December 2009). "Mysteries Surround Afghanistan's Stealth Drone". Wired. http://www.wired.com/dangerroom/2009/12/mysteries-surround-afghanistans-stealth-drone/. Retrieved 8 December 2009. ↑ "US Air Force confirms 'Beast of Kandahar' drone". Asiaone. 9 December 2009. http://news.asiaone.com/News/AsiaOne%2BNews/World/Story/A1Story20091209-184783.html. Retrieved 9 December 2009. ↑ Hoffman, Michael, "Unveiling the ‘Beast of Kandahar’", Military Times, 23 December 2009. ↑ Sweetman, Bill (16 February 2010). "Beast Sighted In Korea". Ares. Aviation Week. http://www.aviationweek.com/aw/blogs/defense/index.jsp?plckController=Blog&plckBlogPage=BlogViewPost&newspaperUserId=27ec4a53-dcc8-42d0-bd3a-01329aef79a7&plckPostId=Blog:27ec4a53-dcc8-42d0-bd3a-01329aef79a7Post:088e4448-9e53-492f-8a14-7671361e1743&plckScript=blogScript&plckElementId=blogDest. Retrieved 18 February 2010. ↑ Fulghum, David A. (8 December 2009). "Beast of Kandahar Is Back in Action". Ares. Aviation Week. http://www.aviationweek.com/aw/blogs/defense/index.jsp?plckController=Blog&plckBlogPage=BlogViewPost&newspaperUserId=27ec4a53-dcc8-42d0-bd3a-01329aef79a7&plckPostId=Blog:27ec4a53-dcc8-42d0-bd3a-01329aef79a7Post:162bbb57-2de3-4ec1-9044-a462348f534a&plckScript=blogScript&plckElementId=blogDest. Retrieved 11 August 2010. ↑ Miller, Greg (18 May 2011). "CIA flew stealth drones into Pakistan to monitor bin Laden house". http://www.washingtonpost.com/world/national-security/cia-flew-stealth-drones-into-pakistan-to-monitor-bin-laden-house/2011/05/13/AF5dW55G_story.html. Retrieved 19 May 2011. ↑ Paul Richter, David S. Cloud and Alex Rodriguez (27 May 2011). "Angry Pakistan rejects U.S. appeal, plans to review drone campaign". http://www.latimes.com/news/nationworld/world/la-fg-pakistan-clinton-20110528,0,6909030.story. Retrieved 28 May 2011. ↑ Sanger, David E.; Broad, William J. (4 December 2011). "Explosion Seen as Big Setback to Iran’s Missile Program". http://www.nytimes.com/2011/12/05/world/middleeast/blast-leveling-base-seen-as-big-setback-to-iran-missiles.html?scp=1&sq=RQ-170&st=cse. Retrieved 5 December 2011. ↑ "Iran airs footage of downed US drone". Press TV. 8 December 2011. http://www.presstv.ir/detail/214542.html. Retrieved 11 December 2011. ↑ "'Iran military landed US spy drone'". Press TV. 9 December 2011. http://www.presstv.ir/detail/214683.html. Retrieved 11 December 2011. ↑ "US maintains silence on downed drone". Press TV. 10 December 2011. http://www.presstv.ir/detail/214765.html. Retrieved 11 December 2011. ↑ "Iran military downs US spy drone". Press TV. 4 December 2011. http://www.presstv.ir/detail/213765.html. Retrieved 11 December 2011. ↑ 33.0 33.1 Jaffe, Greg; Erdbrink, Thomas (5 December 2011). "Iran says it downed U.S. stealth drone; Pentagon acknowledges aircraft downing". http://www.washingtonpost.com/world/national-security/iran-says-it-downed-us-stealth-drone-pentagon-acknowledges-aircraft-downing/2011/12/04/gIQAyxa8TO_story.html?wprss=rss_national-security. Retrieved 5 December 2011. ↑ Miller, Greg (6 December 2011). "After drone was lost, CIA tried a head fake". The Washington Post. http://www.washingtonpost.com/blogs/checkpoint-washington/post/after-drone-was-lost-cia-tried-a-head-fake/2011/12/06/gIQAJNrnZO_blog.html. Retrieved 8 December 2011. ↑ "Iran Captures a U.S. Stealth Drone Intact". 8 December 2011. http://media.farsnews.com/media/Uploaded/Files/Video/1390/09/17/13900917192923.flv. Retrieved 8 December 2011. ↑ Dave Majumdar (9 December 2011). "Iran’s captured RQ-170: How bad is the damage?". http://www.airforcetimes.com/news/2011/12/defense-iran-captured-rq-170-how-bad-120911/. ↑ 37.0 37.1 37.2 "U.S. officials, analysts differ on whether drone in Iran TV video is real"]. CNN. 8 December 2011. http://www.cnn.com/2011/12/08/world/meast/iran-drone/index.html. ↑ Orr, Bob (8 December 2011). "U.S. official: Iran does have our drone". http://www.cbsnews.com/8301-18563_162-57339834/u.s-official-iran-does-have-our-drone/. Retrieved 11 December 2011. ↑ "Iran Says It Is Building Copy of Captured US Drone". 22 April 2012. http://www.nytimes.com/aponline/2012/04/22/world/middleeast/ap-iran-us-drone.html?_r=1&hp. Retrieved 22 April 2012. ↑ "Iranians Say They Took Secret Data From Drone". The New York Times. 22 April 2012. http://www.nytimes.com/2012/04/23/world/middleeast/iranians-say-they-took-secret-data-from-drone.html. ↑ . FarsNews, 22 September 2013. ↑ "Iran releases video 'proof' US drone decoded". RT. 7 February 2013. http://rt.com/news/iran-us-drone-decoded-609. ↑ Daily Telegraph"Iran shows off captured US drone". London: The Telegraph UK. 8 December 2011. http://www.telegraph.co.uk/news/worldnews/middleeast/iran/8944248/Iran-shows-off-captured-US-drone.html. Retrieved 8 December 2011. Wikimedia Commons has media related to RQ-170 Sentinel. "Black UAV Performs In Afghanistan". Aviation Week. 11 December 2009. http://www.aviationweek.com/aw/generic/story.jsp?id=news/BEAST121409.xml&headline=Black%20UAV%20Performs%20In%20Afghanistan&channel=awst.